This Valentines Day, Rock & Roll Hall of Fame great and vocalist, songwriter, and bass player of The Moody Blues JOHN LODGE comes to the East End with classic anthems from one of rock’s greatest bands. Lodge has been performing and recording with The Moody Blues for more than five decades, selling in excess of 70 million albums. Lodge has been voted one of the “10 most influential bass players on the planet,” with hits including “Nights in White Satin”, “I’m Just A Singer (In A Rock ’n’ Roll Band)” and “Isn’t Life Strange?” among others. 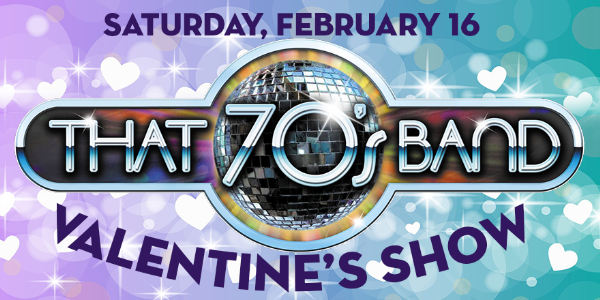 This Valentine’s Day, start a Love Train with Long Island’s reigning kings and queens of disco, funk, and groove- THAT 70s Band. Bring your partner dancing on the elegant Suffolk Theater dance floor to everything from Earth Wind & Fire to Commodores to Chic & MORE..
An elegant evening of wine, dining, dancing — and THE SUFFOLK THEATER DANCE FLOOR IS OPEN! !